I read this when it first came out in paperback and totally loved it. I was prime reader for it though, being a history major and having taken ”Cultural and Intellectual History of the US” 1 and 2 at uni. They were wonderful classes and I remember some of our texts to this day. Had Menand’s book been published then (or were the course taught today) it would have fit perfectly and I’m sure we would have been assigned several readings from it. There was a LOT on Transcendentalism and the Pragmatists (and much more). I often wonder what old Dr. ____? would have thought of Menand’s book. Still, even with that class there is so much I don’t know – even having read this book before there is so much I don’t remember! And the best part of rereading is that everything fits together better the second time ’round. And my head is floating with all the other socio-cultural-intellectual things which were going on around these guys from the Gilded Age to Reconstruction to Walt Whitman and Manifest Destiny – much more. But all that is not covered here – Menand’s book is about the radical change in intellectual/philosophical assumptions which characterized the post Civil War era. The old ideas had not prevented the most viscous war the US had ever seen (has ever seen) – democracy was NOT supposed to be about this type of conflict resolution. Peirce, Holmes, James and Dewey among others sought ideas which would work. Ideas should never become ideologies, but should be tools which people can use to cope and hopefully make the world better. The first four Parts (chapters 1-12 – to page 337 – about 3/4 of the book ) are mini-biographies of the featured philosophers, Holmes, James, Peirce and Dewey. 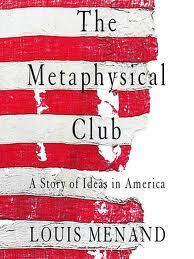 The “Metaphysical Club” takes physical place for a very short time toward the end of Peirce’s bio (Part 3). It was kind of a let down to learn there was so little substance to it. Still, the book is a 10 because of everything else! Anyway, Menand apparently structured the book in keeping with the philosophy – that is, ideas come from individuals who experience life in communities comprised of morés, attitudes, ideas, events and so on. So the point is where did these Pragmatists, as they would become known, come from – what ideas, what attitudes, what events? That’s the reason for the biographies. I love all four – I’ve tried to think of which one might be closer to my heart and mind but I can’t pick just one, they’re each special. And the four separated in various takes and activities with Pragmatism – James gave it that title and continued to pursue his studies in psychology. Chapter 14 is entitled “Freedoms” and deals with academic freedom for which Dewey and other professors across the US fought – very complex issues involved. There is also more about Holmes and his application of the ideas of Pragmatism from the Court. The Epilogue winds all this up by following the principal subjects and their ideas through the generations up until now.